Virtually everyone has some astigmatism which is asymmetry in the shape of the cornea. To understand astigmatism, think of the difference between a football and a basketball. A basketball is round and symmetric and bounces true. A football is not symmetric and does not bounce in a true fashion. In this example, a football has astigmatism and a basketball does not. Light will not pass in a true fashion through an eye that has significant astigmatism. While this does not harm the adult eye, it can caused vision to be blurry. The Georgia Eye Specialists have several treatment options to reduce astigmatism. For most people, special “toric” contact lenses can be used. Our contact lens specialists would be happy to fit you with these to help you see better. Glasses are another good option. If you have a visually significant cataract, upgraded astigmatism implants are available which can decrease your astigmatism and reduce your dependence on glasses. Please discuss these lenses with Dr. Chopra or Dr. Benedict on your visit here. These implantable lenses require extra training to put in, and we are one of the centers that are certified in their use. Other surgical options that merit mention include LASIK or PRK. Dr. Benedict has been doing LASIK since 1998. This procedure also can treat myopia (nearsightedness) and hyperopia (farsightedness). It can be done in patients without cataracts or after cataract surgery. There are many possibilities to treat astigmatism. Please ask Dr. Chopra, Dr. Benedict, or Dr. Furman if you have any questions regarding what is best for you. 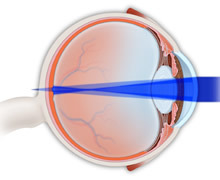 To learn more about Astigmatism Reduction or to make an appointment with us, please call 770-419-1393.